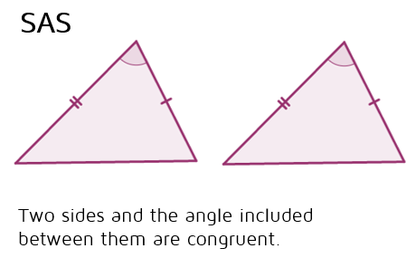 The SAS postulate says that if two sides of one triangle and the angle included between them are congruent to two sides and the included angle of a second triangle, then the triangles are congruent. Let's say you have one triangle with side lengths 5 and 10 and the angle included between those two sides is 30 degrees. If you have a second triangle that also has side lengths 5 and 10 with a 30 degree angle in between, then by the SAS Postulate we know that the two triangles must be exactly the same size and shape. Make sure to notice the order of the letters in SAS. The A is in between the two S's. This indicates that the angle must be included between the two sides. 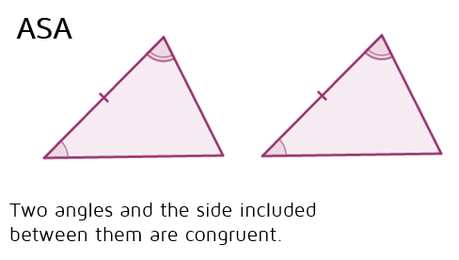 The ASA Postulate says that if two angles and the included side of one triangle are congruent to two angles and the included side of a second triangle, then the triangles are congruent. Let's say you have one triangle with angles that are 30 and 50 degrees and the side in between those two angles is 9 cm. If you have a second triangle with 30 and 50 degree angles and the side in between those angles is also 9 cm, then the triangles must be exactly the same shape and size by the ASA Postulate. Make sure to notice the order of the letters in ASA. The S is between the two A's. This indicates that the side must be included between the two angles.